I have a FAQ custom list in Sharepoint 2010 with two columns: Question (title column renamed) and Answer. 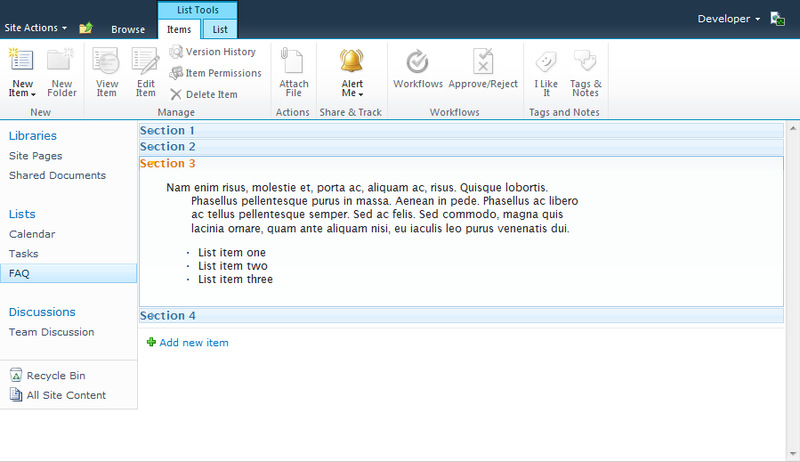 I want to display the questions and answers from the sharepoint list in JQuery Accordion. How can it be done? Aboud, actually, there are several ways how to accomplish this. In your case when you have FAQ custom list, i am suggesting you to create additional custom view for displaying list items in accordion. Please note that you have to change FieldRefs element properties to your own, i.e ID, Name and DisplayName for fields Question and Answer. Also note that i am referencing custom XSLT style sheet for rendering custom View that we have added before. version="1.0" exclude-result-prefixes="xsl msxsl ddwrt x d asp __designer SharePoint ddwrt2"
Below is shown FAQ List View displayed as Accordion for my case. P.S. For more details, please see this post. My simplest approach was using one Announcement list and jQuery tools (http://jquerytools.org/demos/tabs/accordion.html), plus one CEWP to include relevant scripts (stored in the a Library). We ended-up building a simple web part using SPDataSource with a CAML query to load it. Not the answer you're looking for? 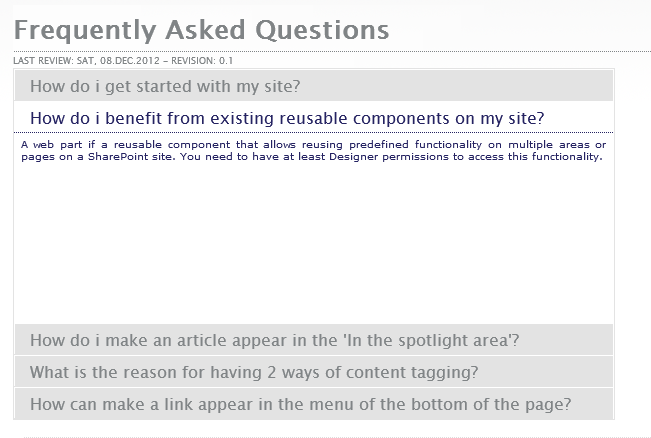 Browse other questions tagged 2010 development list jquery custom or ask your own question. Alternate colors of data from two lists?